Rosita's staff and students celebrate being named a 2018 CA Distinguished School for high academic outcomes! Rosita Elementary - home of the Roadrunners! Roadrunners pledge to say no to drugs in honor of Red Ribbon Week. Roadrunners celebrate moms on Mothers Day with tasty pastries! Students are recognized on the first Friday of each month at our Monthly Awards Assembly. Awards are given in each classroom for Effort, Citizenship, and two focused Scholarly Habits. Academic Awards are recognized each Trimester. Rosita staff and I would like to welcome you and your child/ren to the 2018-19 school year. 2018 has been a great year of recognition for our Rosita Community. We were named a 2018 California Distinguished School for our continued student success. This came about through the hard work of the students, staff, and parent community working together to promote and facilitate students being the best they can be! We also were recognized as an Educational Results Partnership Honor Roll School. We are part of the Garden Grove Unified School District which was named as the first and only Orange County Exemplary District. I look forward to working together with students, staff, and parents to continue providing the best educational experience possible for our students. Students who come to school ready to learn and follow school rules are the ones most successful in school. Thank you for your continued support of Rosita and its programs. If you have any question or concerns, please call me at (714) 663-6418. It is my pleasure to be part Rosita Learning Community again this year. I believe all children can learn at high levels and it is our duty and mission to help them be all that they can be and to prepare them for Intermediate School and beyond. At Rosita Elementary School we provide a safe and positive learning environment for children. Student success is based upon teamwork between school, home, and community. Students who follow the rules are the ones most successful in school. We expect scholarly behavior from all our students. Garden Grove Unified School District has developed an educational program that is consistent with research and effective practices. Our School Plan is based on student needs and survey results from parents, students, and staff on how we are meeting the goals of the District Strategic Plan. Rosita Elementary School emphasizes student-teacher interaction, order and purpose, student-centered decisions, an attitude of optimism, enthusiasm and high expectations. Students are valued by teachers and experience programs that express caring for students, and encourage parent participation and community involvement. Every year brings us new challenges as we move forward with a Growth Mindset. We continue to show growth in our SBAC Testing for 3rd – 6th Grade students in both Langauge Arts and Math. Students and parents have access to more resources online from home for both our reading and math programs. We are incorporating more technology into everyday instruction to prepare and support our students for 21st Century learning. We have an outstanding Preschool program for 3 and 4 year olds that help prepare them for Elementary School success. I look forward to continue meeting and getting to know our parents, students and staff to work together to build an even greater Rosita learning community. Please keep yourself informed and participating by reading our Tuesday Newsday sent home most Tuesdays in our Take Home Tuesday folder. You also can help by reading and signing the planner daily in 3rd – 6th grade. Don’t forget to be part of our PTO and attend our Pastries for Parents throughout the year. I have an “open door” policy, so please feel free to come in and discuss any thoughts, suggestions, or concerns you may have. Rosita scholars will continue to grow and learn with the support of you, our community, and staff. Go Roadrunners! To ensure student success, we will provide a rigorous and supportive academic experience that motivates all learners to meet high expectations. What’s so special about Rosita? Academic Excellence, 21st Century Technology, Student Recognition, Parent and Community Engagement, and our School Garden to name a few! 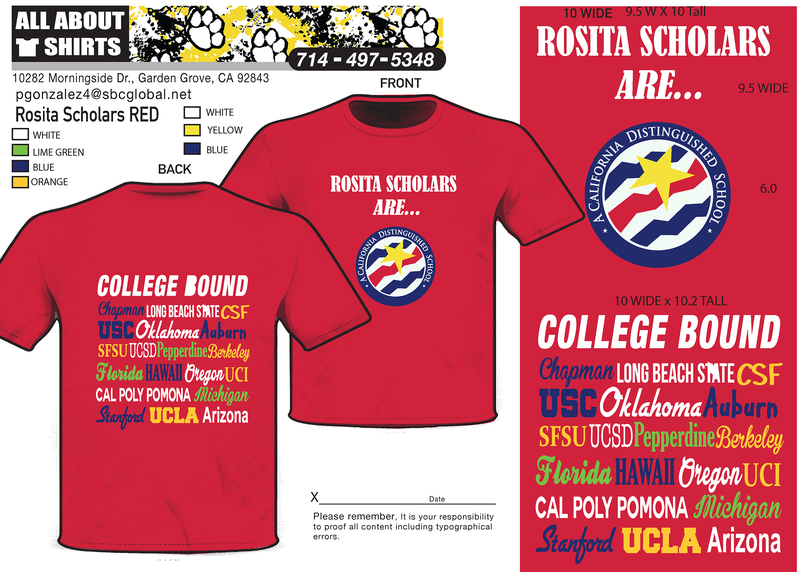 Academic Excellence: Rosita was named a 2018 California Distinguished School and a 2018 California Honor Roll School for academic success and high levels of college readiness among students! These prestigious awards are only presented to the state's most inspiring and successful public schools. 21st Century Technology: Rosita has a 1:1 computer to student ratio and students engage with iPads and/or Chromebooks as part of daily instruction. We have a Technology Assistant in our computer lab. Many of our students participate in an after school Coding Class and last year 60 students participated in a First Lego League Robotics Competition sponsored by Lego Land. They built and programmed several robots that completed tasks at Lego Land against many other schools from Southern California. Modernized Campus: Rosita Elementary School boasts a recently-modernized campus with increased security and air-conditioned classrooms. Free State Preschool: Rosita is proud to offer a free state preschool program on campus and childcare and after-school activities in academics, art, and athletics through the Boys & Girls Club. College Readiness: Rosita’s robust College and Career Mentoring Program pairs elementary students with college students who serve as positive role models, provide help with school work, and promote positive self-esteem. Positive School Climate: Our positive school climate promotes student success. Students are valued by teachers and staff and feel a connection to the school through a variety of special events. Each class leads the school in a weekly Friday Flag presentation that includes a Patriotic song or topical skit. Our active Student Council sponsors many Spirit Days, Santa Grams, and Valentine Grams. Students participate in our Halloween Parade and Pumpkin Decorating Contest, Kindness Week, Read Across America Week, Red Ribbon Week, 100 Days of School celebration, March in Motion, and Monthly College Promotion Days. Our sixth grade students participate in an Overnight Aquarium Field Trip, along with many other special sixth trade activities. We also have our school garden planted with a “Salsa Garden” theme with tomatoes, onions, peppers, and cilantro that we plan to harvest in May with a tasting for students. Parent Engagement: Rosita offers many opportunities for parents to engage in their child’s education through online resources to help with homework support as well as family technology nights, PTO, and parent education classes. Parents enjoy our welcoming climate through participation in school community events like Kite Day, Walk-a-thon Color Run, Track and Field Days, Pastries with Parents, BBQ Movie Night, Skate Nights, Santa’s Breakfast, Muffins with Moms, Donuts with Dads, Volunteer Breakfast, Green Eggs and Ham Breakfast, and Family Nights with Math and Technology. Teachers and staff recognize the hardworking 2nd trimester honor roll students! Students roll out the red carpet to celebrate their recognition as a 2018 CA Distinguished School! Rosita students engage with 21st century technology as part of daily instruction! Roadrunners say "itune out drugs" during Red Ribbon Week! Roadrunners take a break and recharge after their run. During Red Ribbon Week, students show how drugs make one crazy. Roadrunners take a field trip to apply in-class knowledge to the real world. The roadrunner mural represents the talented students at Rosita Elementary!